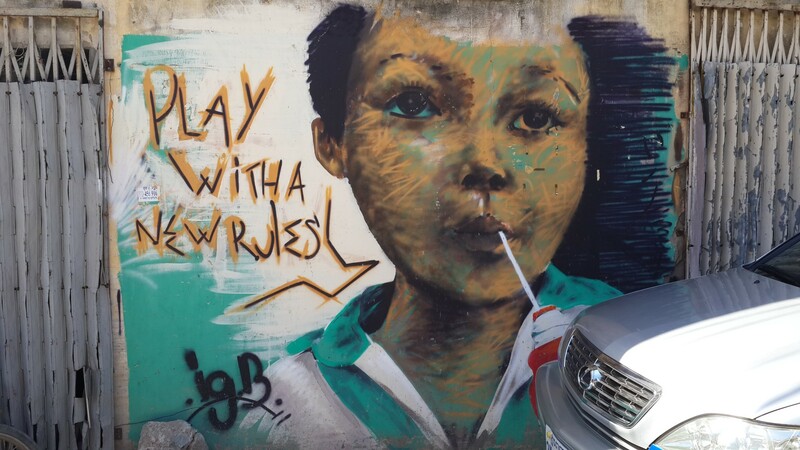 Street art in Phnom Penh that captured the sentiment for 2015. The time to reflect on the year gone by and plan for the next is upon us once more. Each year I like to consciously recognise what went well, what didn’t, and to identify the differences that made THE difference between the two. You can see the full process I follow here – Annual Review 2013. Overall, 2014 has been an amazing year full of new countries, people and experiences. I cycled 8600 miles from Turkey, through Iran, with a stop off in Dubai on route to India, Nepal, Myanmar, Thailand, Laos, Cambodia, and into Ho Chi Minh City, Vietnam, where I now reside. That said, much of what I set out to achieve has not come to pass. 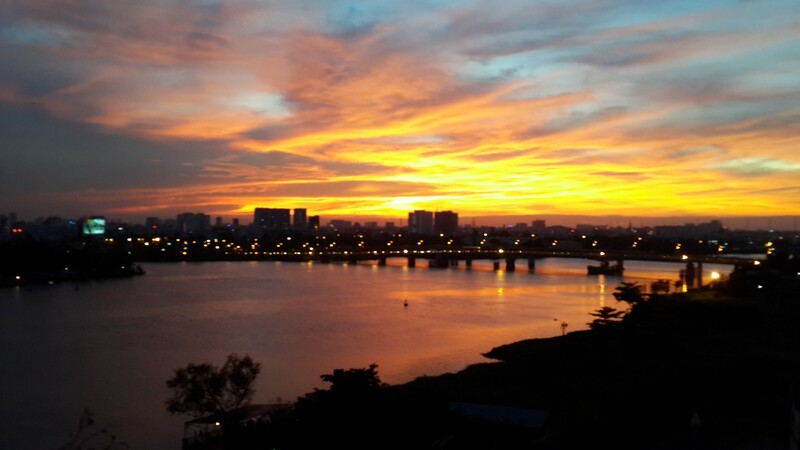 The view from my balcony in Ho Chi Minh. Each goal I didn’t achieve came down to a lack of focus on the desired outcome, each goal I achieved happened due to consistent focus on what I wanted. On the surface this is not rocket science, or particularly helpful, I had to dig deeper to uproot the factors that re-directed my focus. More often than not, fear, discomfort or self doubt about my ability to achieve a specific goal shifted my focus away from the steps required to make it a reality – focusing instead on the reasons why I could not achieve the goal. At the time, the shift in focus was unconscious, usually triggered by an obstacle and followed by negative self-talk. For example, when learning a language in a new country I would use words and phrases of the target language with native speakers, and still not be understood (speaking Scottish in different languages often creates that result!). That would act as an obstacle to learning the language, followed by frustration and negative self-talk which shifted my focus onto the reasons why I could not learn the language. All of which reinforced any underlying fear, discomfort or self doubt I had about learning the new language. On a higher level my focus on learning languages shifted to the route of least resistance: charades! Unfortunately, that was a very ineffective way of communicating and often resulted in frustrating exchanges of money for stuff I didn’t want – think: offal stew or sheep’s head instead of rice and vegetables! Over the last few months I struggled to add a new blog post each week because I got out of the habit of writing, which made the process more difficult. I then started to question if I had anything valuable to say (lack of belief) and allowed negative self-talk to sabotage my writing efforts. Whether I do have anything valuable to say is questionable, but there’s nothing new about that. The point is that writing, being creative, learning a new language, meditating, cycling or practising yoga all require different mental and physical muscles. When we stop flexing them they atrophy – sadly, we can’t go to the gym once and remain fit forever – we have to keep going. In my experience, just consistently showing up is more important than what you do once you get there because it reinforces belief, attitude and focus towards what one wants. The same pattern of thoughts and behaviours was present when I looked at each of my failures and caused me to consider how I could fundamentally hack the cycle. Conversely, when I looked at my successes they all occurred as a result of unquestionable belief and persistent, habitual behaviour. Cycling, practising yoga and meditating are areas where I achieved what I set out to, not because I didn’t meet obstacles, fear, discomfort or self doubt, but because I believed I could overcome them, and made a habit of doing so. Beliefs, focus and attitude influence what we achieve through the stories we tell ourselves about what we can and can’t do. Most of these stories are whispered in the back of our minds just outside of conscious awareness, silently orchestrating our every move. Many of which are repeated so often that even when we become aware of them they are still accepted as the truth. But we are not the sum of our past and we have the ability to re-write our stories. The things that get done happen as a result of habitual behaviour. Turn goals into habits. Consciously choose the beliefs and attitudes that direct focus towards what you want, then fiercely protect them. Right thinking creates right action – pay attention to what you are thinking. Fulfilment comes from struggling for something worth struggling for. When I feel down, pessimistic, worried, overwhelmed or lack confidence it is always because I’m NOT struggling towards the stuff I think is worth struggling for. When I take the easy option too often, which normally involves consuming instead of doing, life gradually becomes un-fulfilling. To make use of these lessons in 2015 my goals are all centred around cultivating the right behaviours on a daily basis. Cycling doesn’t feature as I intend to stay put, earn money and integrate into the local area. To make it more achievable I will concentrate on following the daily schedule five days a week. Hopefully, each of the daily tasks will move me closer to achieving my overall goal for 2015, which is, ‘mastering the inner game through increased self awareness.’ There are many specific goals I aim to achieve, however, fundamentally I want to gain better control over my mind! I’m aware that sounds very woo woo but the link between increased self awareness and external performance improvements is widely documented and gathering pace by the day. Fitz Pearls, one of the founders of Gestalt therapy, said that ‘awareness in and of itself is curative.’ Meaning we can change our stories by consciously identifying what they are AND recognising if they serve us or not. I have found Meditation to be the most effective way to increase self awareness. I know this term may conjure images of tree hugging hippies – meditation has a PR problem – but don’t let that stand in the way of the benefits. Recent scientific research has shown meditation to enhance attention, increase test scores, reduce stress, boost immune function, increase grey matter density, increase cortical thickness and the integrity of connections between brain regions important for cognitive control. The research on meditation is in its infancy, however, the implications of what is already known has proven that the brain is not ‘fixed’ in late adolescence, with regard to personality and innate potential, as was previously believed for decades by neuroscientists and psychologists. Meditation actually plays an important role in brain plasticity, facilitating changes in personality and potential. Cycling around the world was always an experiment to explore the world around me and within me. The discoveries I’m making along the way are literally guiding me to places I did not know exist. But everywhere I go, there I am. The inner journey is proving much more challenging than the outer, and over the next year I will be writing about how I get on sticking to a prescribed daily schedule. Will it lead to greater happiness and fulfilment, or misery? 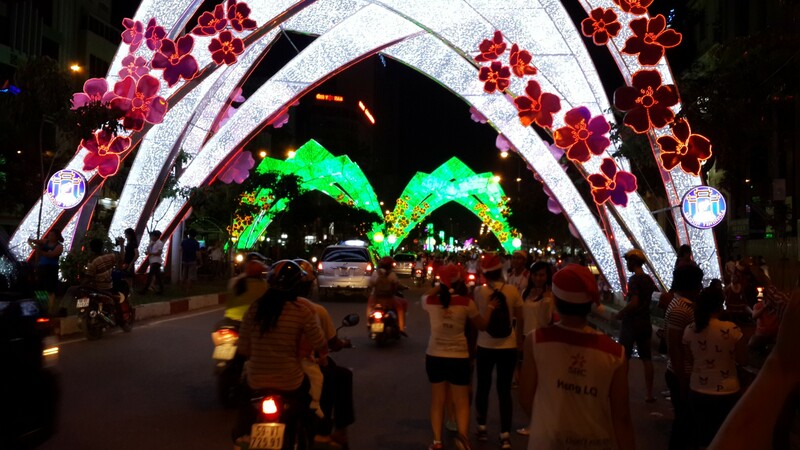 A night out with the Sunday Running Club (folks in the Santa hats) delivering sweets to kids in Ho Chi Minh. Does this mean no cycling for a year? Have the cycling plans been scrapped or just postponed? I love your outer journey writing – that doesn’t mean I can’t appreciate the inner one (speaking as an old hippie who took it very seriously back in the day). I will be staying put for the next year (depending on visa renewal) so the outer journey will continue through immersion into vietnamese culture. Passing over the surface of countries slowly on a bicycle is a great way to see and experience more than flying in and out of foreign lands on holiday. I now want to dive in, swim with the locals, understand how and why their way of life has evolved the way it has. Living, working and most importantly learning the language should make for an equally interesting outer journey. It’s one I’m excited about sharing and hope it will contain enough adventure and contrast to keep you interested too. Always great to hear from you Geoff, best wishes to you and Karen for 2015. A really thought provoking piece. I’ve been awake since 3.45am letting my brain overthink things. I need to follow some of your principles I think back here in Blighty. I used some of your writing with my students, they really enjoyed it. And my 7 year old often asks where you are now as I’ve told her all about your journey. A happy new year to you Fraser. Not wanting to diminish your achievements over the last year I really think,knowing you as I do, there is a danger of your blind faith in the positivity of self discovery which may be very dangerous . Early in your piece you say you are staying in Vietnam for a year and not cycling, it’s a big place and being attached to other big places should mean it’s perfect to discover the Vietnamese and travel as well.keep cycling dear boy. Self discovery which ,as I am aware, is a journey you have been on for so long now which could lead you to a place which says ‘your a feckless loser running away from the responsibilities and rewards of commitment “. etcetera.deluding yourself that the continual process of searching ,using alternative strategies ,is really a way of saying the discoveries made so far are not what you want to find,simply put this can’t be true and therefore I will carry on until I find the person I am actually happy to be as opposed to being happy as you are. Think what more you could be doing getting on with life itself without the artifice of self discovery, and let’s be frank about this ,it’s hardly new territory is it? This is not about the human condition and your great insights but a self indulgent piece of psychobabble. Having said that ,the very best of luck with it all Fraser . I have read and re-read your comments above and I am still non the wiser to what you are on about?? I’m not sure there is anything positive to take from it? Thanks for responding Fraser, hope your well and enjoying Vietnam. My point is that all discovery is not always the positive experience described by you as my experience working with my clients points to the mechanisms of denial providing protection from the miserable reality of the truth in many cases. I do realise that this is a narrow experience and I work with some pretty damaged clients. It’s just an alternative perspective and I always loved our discussions about NLP and other alternative thinking/ life strategies. Are you contemplating a return to the uk soon? Thank you for your concern, but I’m doing well and confident I won’t end up a ‘feckless loser’, despite my persistence to follow the road of self discovery. I don’t believe that self actualisation/ nirvana exist as a destination to be reached, more a direction in which to head. And of course the journey is entirely within yourself, it’s not something you that you do for a few years then move on to something else, it’s a life long commitment to learn, develop and grow. As children we taking on the values, beliefs and attitudes of our parents, friends and peers unconscious of the consequences they will have as we make our way through life. We didn’t decide at the time if a particular value or belief was true or if it would serve us, we just absorbed it. In my experience challenging the values and beliefs that are limiting our potential is like peeling back the layers of an onion, the more layers you peel away the more you become who you really are, unhindered by external conditioning. It isn’t a process of searching, it’s a process of becoming. I’m not sure what you would have me ‘doing getting on with life itself without the artifice of self discovery,’ my purpose in life is self discovery! How would I decide what to do if I wasn’t guided by what I wanted to learn or skills I wanted to develop? Isn’t our responsibility to fully express who we are in the short time we’re here? There is nothing I can write that hasn’t been written before and having a personal blog is about as self indulgent as it gets – well spotted. I read people blogs to find out how they see the world and what their doing to navigate it, and to remind myself of useful stuff I forgot. It’s taken me a while to get back to you because I found what you wrote a little painful to read. You made some interesting points and punctuated them with some fairly harsh critisism about how I’m choosing to live my life. Which caused me to question it, thank you. What I’m trying to do is live outside of the boundaries we’re channeled into by our minds, society, expectations, etc to see what’s on the other side. Not to see if the grass is greener, but to find out if there is any grass at all. There is little to learn from doing the same things over and over again. My responsibilities and commitments are different to yours, I committed to raising money to build a school and feel a deep sense of responsibility to finish what I have started. If this episode of self indulgence helps enable access to education for five hundred new children each year it will be by far my greatest contribution to date. If I can do that while satisfying my curiosity to see the world through the adventures of bicycle travel, and whatever else takes my fancy along the way, for me, that’s a life worth living. ETA for a return to the UK is currently unknown. All the best Gordon, I look forward to seeing you when I get back. Thank you for that carefully considered response,always an interesting read and I understand clearly your aims and desire for self discovery. There are many journeys is life,time passing the most obvious, physical travel as well as spiritual. Each to their own way and I feel, as I am sure you do, that many people rarely pause to reflect on the world and their place in it or reach conclusions that are productive if they do. Loved the last missive and so wonderful to see your parents looking so well and clearly enjoying a robust and stimulating retirement. I haven’t been commenting much but I’ve still mostly been keeping up to date with your journey. It’s good to know you’re doing well and have a set plan for 2015. Good luck with it, I hope you’ll be able to keep to your resolutions and that they’ll bring what you’re looking for. What are you going to do in Vietnam? Do you have any plans? Thanks Anne-Laure, have a great 2015! After cycling across France last year, I said to myself one day I will cycle across the world. It’s good to see somebody carrying out the same dream. I was wondering if you’d be so kind as to give me an insight into how much you saved up for your trip of a lifetime? Or perhaps an estimate for total costs so far? I could happily get by eating bread and jam for a couple of months. However without a shower the chafage would be unbearable.